Alyanna Martinez expressed her innermost thoughts about the “false rants” of a person she did not name a day after her mother, Liezl, was cremated. 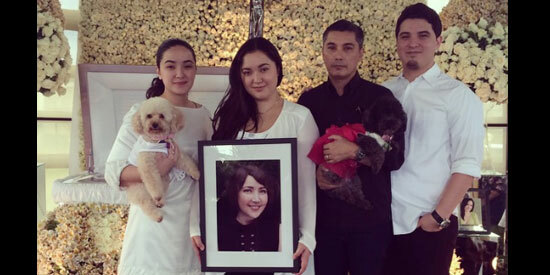 Liezl, a former child actress, died after years of battling breast cancer. In an Instagram post, Alyanna, the eldest among the three children of Albert and Liezl Martinez, wrote that someone is spreading lies about her late mother and their family. She said no amount of vilification can alter the truth about who really cared for Liezl. Alyanna Martinez, second from left. “Believe what you want. Actions speak much louder than words. A flat out lie will always be a lie. And the truth will always be the truth no matter what. My mother is no longer around to defend herself so I delegate that task to myself now. If you truly love a person, you don’t destroy them. Living and/or d**d.
Enough said, God will have the final judgment at the end and our entire clan can rest in peace knowing the truth and not all the malicious attention seeking lies being spread around. Social media users believe that Alyanna was alluding to her grandmother, actress Amalia Fuentes, who made a scene at the cremation of Liezl, who is the veteran actress’ only child with husband Romeo Vasquez. The 74-year-old Fuentes claimed that she was shut out of Liezl’s life. She also accused her daughter’s family of posing for “publicity” to show Liezl’s happy moments with them which the fuming former actress, dubbed as the Elizabeth Taylor of the Philippines, said were not true.